If you were an investor in US stocks, 2017 was a very good year for you. Faced with a wall of macro economic and political worries, the US equity market proved more than up to the challenge and delivered good returns, proving the experts wrong again. Looking back at the year, the word that I used to describe US equities at the start of last year, which was "resilient", best described US stocks in 2017 as well. As we enter 2018 with US stocks at historical highs, worries remain, but stocks are on a healthier footing now, than a year ago, in terms of fundamentals. At the same time, the long promised surge in T.Bond rates that the Fed watchers promised us would happen in 2017 was nowhere to be seen, which raises interesting questions about whether we should waste our time listening to either stock market prognosticators and Fed watchers. But then again, without them, how would CNBC fill all its time? The return on the S&P 500 for the year was 21.65%, with price appreciation accounting for 19.43% in returns and dividend yield representing the remaining 2.22%. In fact, the S&P 500 increased in ten of twelve months, with August representing the only significant down month; stocks were barely down in April. The T.Bond rate stayed within a tight bound for much of the year, with rates dropping to 2.12% at the start of September, from 2.45% at the start of the year, before rebounding to end the year little changed at 2.41%. Given that rates changed so little over the course of the year, the return on a 10-year T.Bond, with coupon and price change included, was 2.80%. 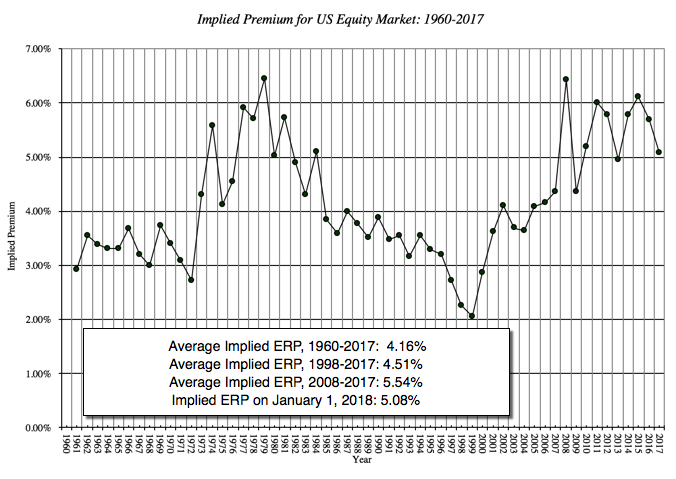 For devotees of mean reversion (and I am not one), this table becomes the basis for estimating equity risk premiums, with the geometric average returns pointing to an equity risk premium of 4.77% over the 10-year T.Bond rate, i.e., the difference between the geometric average return on stocks (9.65%) and the geometric average return on bonds (4.88%). Note that earnings almost kept track with stock prices for the year, but the change is in the cash returned, where you saw a leveling off in the buyback boom. While that would normally be a negative for stocks, the draw back in buybacks left stocks looking healthier by reducing the cash returned as a percent of earnings from an unsustainable 101.66% in 2016 to 87.95% in 2017. 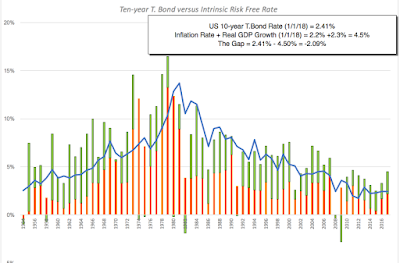 The intrinsic risk free rate, using the estimated numbers as of January 1, 2018, is 4.50%, 2.09% higher than the US treasury bond rate of 2.41%, suggesting that there will be upward pressure on the US treasury bond rate over the next year. It is instructive to look at how the inputs have changed since the start of 2017, when my estimate of the implied ERP was 5.69%. The S&P 500 has risen 19.43%, while cash returned has remained stable; the drop in buybacks has been offset by an increase in dividends. Analysts have become more optimistic about future earnings growth, partly because US companies had a healthy earnings year and partly because of the expected drop in corporate tax rates. 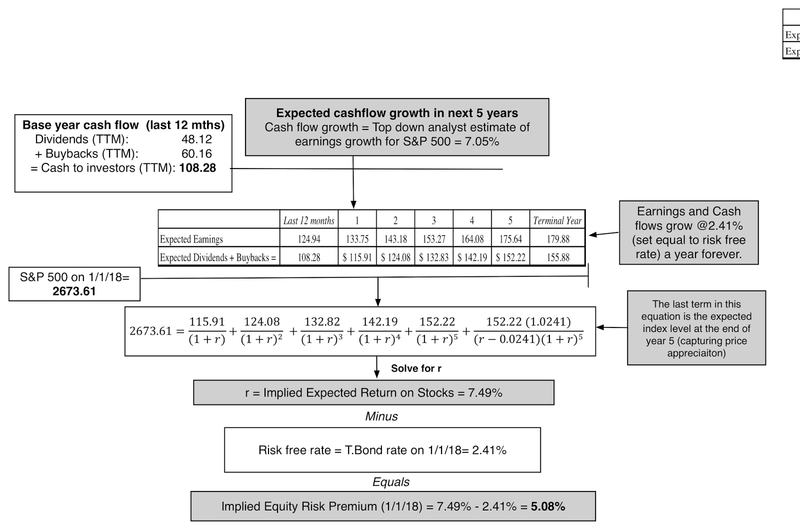 It is true that there are judgment calls that I had to make in estimating the implied premium, including using the analyst estimates of earnings growth for the S&P 500 (7.05%), but the resulting error pales in comparison to the standard error in the historical risk premium estimate. There is a reason why those who are intent on claiming that the market is in a bubble have a tough sell. 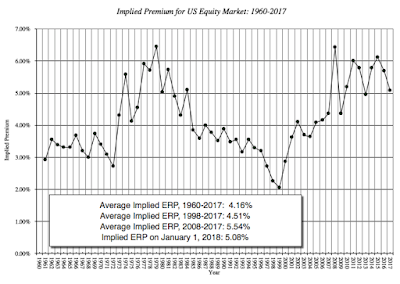 Unlike the end of 1999, when implied equity risk premiums were at historical lows (close to 2%), the current implied ERP is well within the bounds of historic norms. 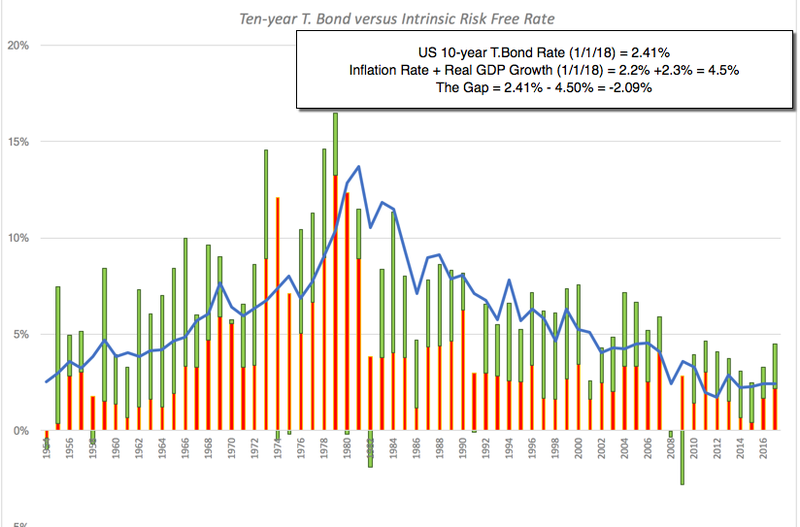 It is only if you read this graph, in conjunction with the earlier one on risk free rates, that you should be concerned, since one reason that the premium is at 5.08% is because the US treasury bond rate is 2.41%. If the T.Bond rate moves towards 4.50%, and nothing else changes, the implied ERP will drop below comfort levels. There has never been a time in the last three decades where I have felt sanguine about equity markets and I am thankful for that, since that is a sure sign of denial about the risk that is always under the surface, with stocks. That said, my worries shift from year to year and in this new year, I will continue to watch how the changing tax code will play out in both earnings and cash flows, since both are likely to be significantly affected, the former, because a lower tax rate should raise after-tax earnings, and the latter, because of the release of hundreds of billions of trapped cash. My macro crystal ball is always hazy but I expect T. Bond rates to rise, but if those higher rates go with a more robust economy, the market will take it in stride. There is the very real possibility that the economy stumbles, while rates rise, in which case US equities will be hard pressed to repeat their 2017 performance next year. How does your ERP map to forward 5 or 10-year returns? Any predictive power? Quite interesting to see cash return ratio below 100%, pointing to the stability of the cash payouts after all. Also, interesting to see the return ratio converge to its 10 year average, which was an input option in your risk premium calculation spreadsheet. Excellent post and thank you for this update! 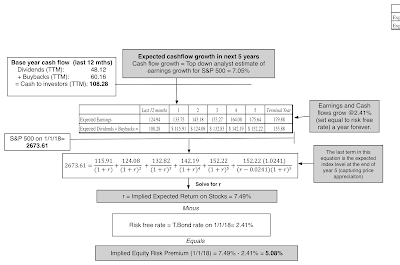 Aswath, last year you calculated Implied ERP based on Expected Dividends+Buybacks(years 1-5 and Terminal Value) Picture: https://3.bp.blogspot.com/-XUEIKgaTHmA/WHfe6QLbRkI/AAAAAAAAD8c/K9sDstkpBf4ivsy5ZaMywm4OGLAumsTvgCLcB/s1600/ImplPremJan2017.png, but now you make the same calculation based on Expected Earnings. Is it OK? Why do you change the approach? Have you made a typo? Surely that equation solves at r = 0.0826 not 0.0749? 124.43 + 123.92 + 123.41 + 122.91 + 122.4 + 2467.53 = 3085? Sorry. The equation in the implied ERP picture was incorrect. It shows earnings in the numerator, when it should have shown dividends and buybacks. The answer (7.49%) is right and I have fixed the equation. Thank you for drawing my attention to it.